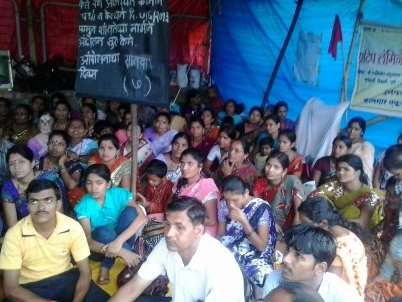 Support the striking workers of Pradeep Laminators in Pune! Chakan industrial estate on north of the city of Pune hosts hundreds of industrial units operating across various sectors including engineering, automobile, packaging. Pradeep Laminators Pvt Ltd, is one of such units manufacturing flexible packaging material and employing more than 100 workers. Fed up with continued oppression, workers under the banner of ‘Pradeep Laminators Workers’ Union’ have began agitation starting last Friday (7th June). While repression at workplace is nothing new to capitalism, the capitalists in this industrial estate have been using goons to muscle down not only workers but villagers. As police themselves have alleged (See: Now, cops blame industry for rising crime in MIDC areas), bosses first used goons to acquire land from farmers and later continued the practice to terrorize workers. Though police for obvious reasons have been modest to say ‘industrialists are partly responsible for increasing crime in the area’ the reality is they are solely responsible for this. 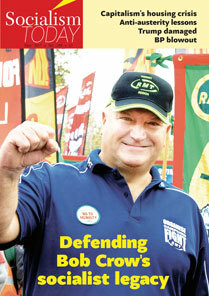 In fact they had these goons to supply them contract labour as well to lead their ‘sponsored’ trade unions. That way they could suppress any rebellious voice of workers. Government and enforcement authorities too supported such arrangement in the interest of ‘maintaining industrial peace’. On this backdrop, the workers at Pradeep Laminators, guided by senior left activists and trade unionist Adv. Vaishali Sareen (Lok Chetna Manch) took an audacious step of forming their own independent union last year on 15th Aug 2012. Obviously this had the management turning vicious towards the union. Following end of contract on 1st Jan 2013, the newly established trade union put forward list of demands including pay hike and requesting management to begin process of negotiating a new contract. Since then management has been using all dirty tactics to suppress the union. Working for around 15 years, workers earn near-poverty wages and many do so only after working for 12 hours. Responding to just demands of pay hike, management has slapped pay cuts on few workers and continued threatening them to break away from union. It has been harassing workers by issuing false show-cause notices or charge sheets under the pretext of disciplinary action. It has flatly denied negotiating an agreement with workers and is instead provoking workers to sabotage trade union. The period also witnessed few goons threatening workers and union leaders to back down. In the meantime Union frequently approached labour office, labour court and also police authorities. But this had had no effect on management. Resolute and firm, the workers union under leadership of Adv. Sareen decided to stage a peaceful agitation though without going on strike. They have setup pandal (marquee) with red flags sporting all around outside gate where workers after finishing with their shifts gather and demonstrate against bosses. They shout slogans and demand immediate negotiations. They have also printed leaflets and have been leafleting workers in the surrounding industrial units and carrying out similar propaganda activities. Various other trade unions across the city have widely supported the agitation and workers are determined to carry through the struggle. New Socialist Alternative- Pune has been closely associated with these workers for past few months. 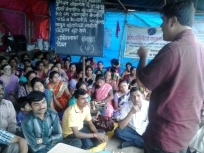 It has been holding regular discussions with them as a part of workers study circle initiative. When on 1st May, Lok Chetna Manch and New Socialist Alternative (CWI-India) together organized workers rally in solidarity with farmers and millions of toilers in rural Maharashtra suffering worst drought in decades, the workers of this union actively participated in it. New Socialist Alternative wholeheartedly supports the agitation. Dist PUNE, Maharashtra, India 410 501.